Let the Universe support you. Know that you are One with the Divine. Let the Universe support you. 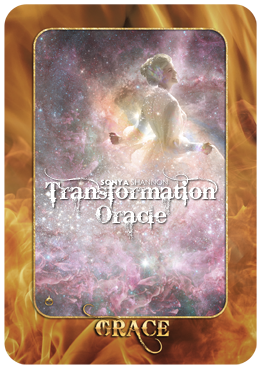 The GRACE card comes into our readings to remind us when and how the Universe opens up and showers blessings on us. These gifts can be obvious, like good timing, willing help and support from others, or unexpected but much-needed guidance or mentoring. Other forms of grace might be a stranger’s kindness, being saved in the nick of time from a potentially dangerous or dark situation, or freely being forgiven a transgression. Grace is also expressed through our natural talents and strengths, including things like good health, strong intuition, or having a knack with animals or children. In certain readings, the GRACE card is simply a reminder of our inner worth and value. Sometimes we forget that we have good reason to esteem ourselves, simply because we are each a beloved child of the Universe. Take a moment and breathe into this truth. This card can be read as a good omen, an affirmation of your wonderfulness, and being in alignment with the Universe’s intentions for us. Congratulations! If the GRACE card appears upside-down, we may be trying to “push the river” or otherwise impose our will on a situation. Lingering feelings of shame, worry, deprivation, or lack of self-worth may be crowding out the Universe’s gifts. Take a deep breath, shuffle the deck, and draw 2-3 cards to see how to overcome these blocks.